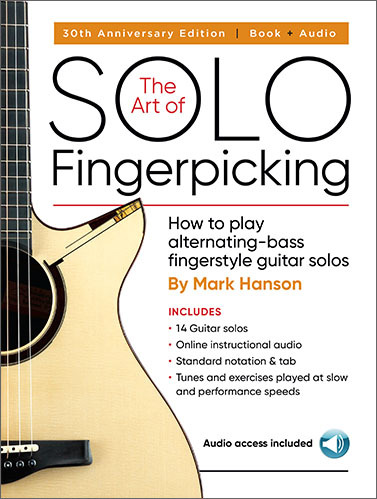 Included in 50 Greatest Guitar Books, this 30th Anniversary Edition of The Art of Solo Fingerpicking teaches intermediate-to-advanced fingerstyle guitar, and features four cool new compositions and arrangements from Mark Hanson. Add hot techniques and pieces to your repertoire! Watch Mark play three of the new instrumentals – Cast Away, Mythos and Easy Virtue – on YouTube. This product is a printed book with online audio available by mail order through Accent on Music’s online catalog. 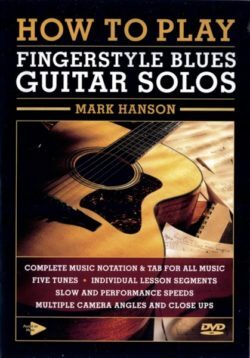 Included in 50 Greatest Guitar Books, this hardcopy book and online recording thoroughly describe the intermediate-to-advanced picking techniques associated with some of today’s greatest fingerstyle professionals. Highly recommended! 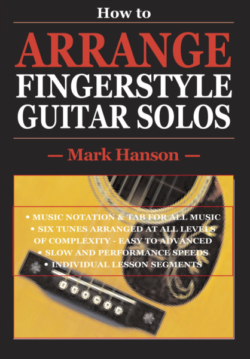 There are 14 solo instrumentals: 12 originals and arrangements from Mark Hanson, including four new pieces from 2018. All exercises and tunes are played at half- and full- speed on the recording. Watch Mark play three of the new instrumentals – Cast Away, Mythos and Easy Virtue – on YouTube. You’ll be able to add hot techniques and pieces to your repertoire with this title. This product is a printed book and with online audio available by mail order through Accent on Music’s online catalog.